Gardaí have appealed to members of the public to come forward with information. GARDAÍ ARE PURSUING several lines of enquiry in relation to the shooting of a man in Lusk earlier this week. Gardaí said today that they were appealing to the public for information in relation to the incident, which occurred at the Dun Emer estate in Lusk, north county Dublin on Tuesday morning. At about 9.35am, a 36-year-old man was shot a number of times in the estate. 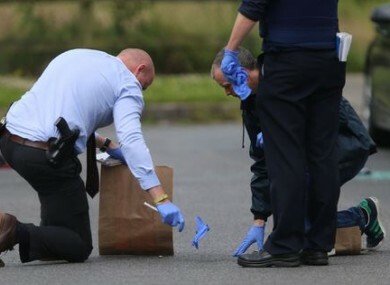 The man, named as 38-year-old Christopher Maguire, was shot as he sat in a car outside his home. Gardaí and emergency services arrived at the scene and transported the man to Beaumont Hospital where he remains in a critical condition. Gardaí said that an incident room has been set up at Balbriggan Garda station following the shooting and a family liaison officer has been appointed in the case. Speaking today at Balbriggan Garda Station, Superintendent Noel Carolan thanked members of the public for their assistance in the case so far appealed for other people to come forward with information. “Several hundred separate lines of inquiry are being followed by investigating Gardaí with assistance from detectives attached to the National Bureau of Criminal Investigation and other national units,” said Carolan. Carolan said that he was also appealing for for information about the movements of a white Volkswagen Golf, bearing a Northern Ireland registration number XFZ 9316, in the days and hours up to 10am on Tuesday. “In particular any sightings of this car in the areas of Dun Emer Estate and Kilhedge Lane, Lusk Co. Dublin,” he said. Anyone with information is asked to contact Balbriggan Garda station 01-8020510 or the Garda Confidential Line on 1800 666 111. Email “"Several hundred" lines of enquiry open in Lusk shooting case”. Feedback on “"Several hundred" lines of enquiry open in Lusk shooting case”.